There are so many amazing treats available during the holiday season. I always overindulge, and it always comes back to bite me. This year is no exception, because this year the boys and I have been spending the holiday season traveling across Louisiana. We've been exploring the best the state has to offer, and tasting their unique cultural dishes. The problem? Spicy food and carbs are a trigger for some rather embarrassing side effects that I would rather no deal with when I'm out in public. Cue CharcoCaps® Anti-Gas Formula. Made with activated charcoal, these caplets help eliminate gas and bloating fast. Activated charcoal is a natural and safe ingredient used by hospitals as an antidote for accidental poisonings. While CharcoCaps® are not a cure for accidental poisonings, they do allow you to eat your favorite food or drinks during the holidays without worry of gas or bloating coming back to haunt you later. One teaspoon of activated charcoal has the surface area of a football field due to is absorption properties. Just take two CharcoCaps capsules during or after eating trigger foods and repeat every two hours if necessary, but do not exceed 16 capsules per day. I love that the CharcoCaps® Anti-Gas Formula is in easy to swallow capsules and can be taken long term or daily without any side effects. These little pink capsules have allowed me to enjoy my favorite foods throughout Louisiana this holiday season without discomfort or embarrassment. For more information, visit CharcoCaps.com. Want a little help buying your favorite holiday foods or gifts for friends and family? 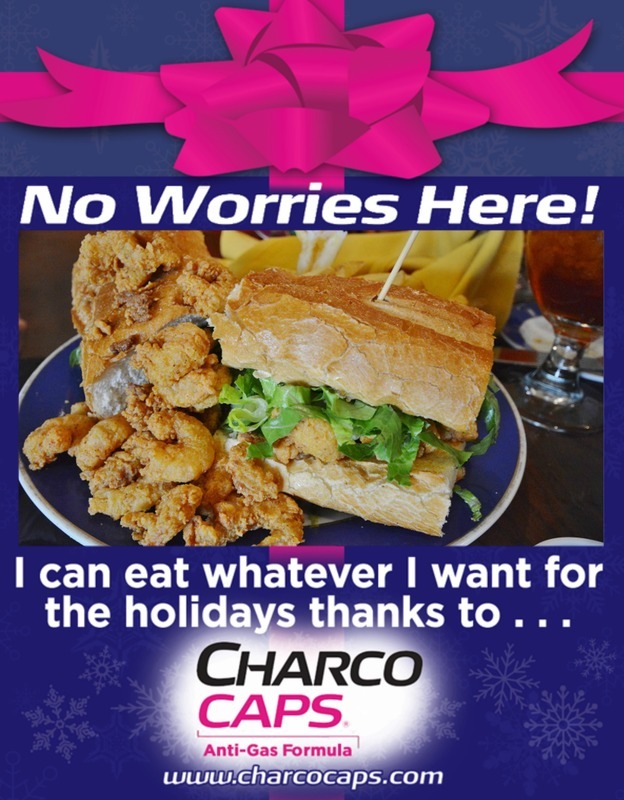 Through December 19, 2014, you can enter the CharcoCaps No Worries Holiday Eating Giveaway for a chance to win one of five weekly $250 Walmart gift cards. One winner is announced each Friday. Do you have a favorite holiday food that is a trigger for gas and bloating?